These parts are built to OE sizes for a perfect fit and made to premium quality standards for great performance. Conveniently packaged with everything you need, all in one easy-to-install kit. The Idler Arm is of the most commonly worn steering components. Poorly designed joints from the factory quickly loosen and cause excessive play in the steering. 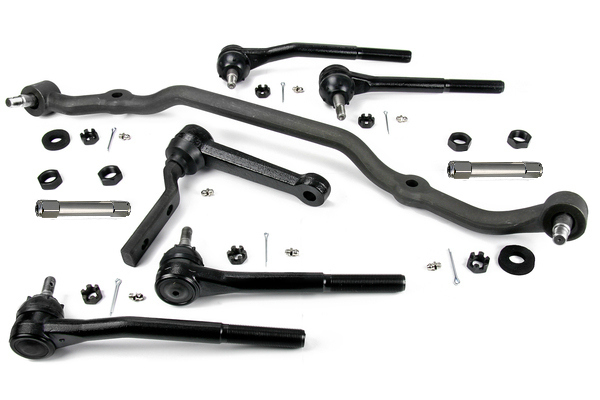 Laboratory tested and proven in the real world, these Idler and Pitman Arms feature improved design over the competition for increased longevity and durability. We applied the same technological advancements in ball joint construction to our line of Tie Rod Ends, delivering a premium product to withstand the rigors of performance car and truck applications. The result is a more durable product that extends the lifespan and maintains the performance level of the steering system during demanding conditions.